One Minute Monday gives a quick fact from our research on employment, skills, and the labour market for you to digest in under sixty seconds. Shortages of workers with Stem (science, technology, engineering, and mathematics) skills are frequently in the news. A common perception is that engineering graduates are lured away from working in jobs directly related to their degrees toward working in finance. 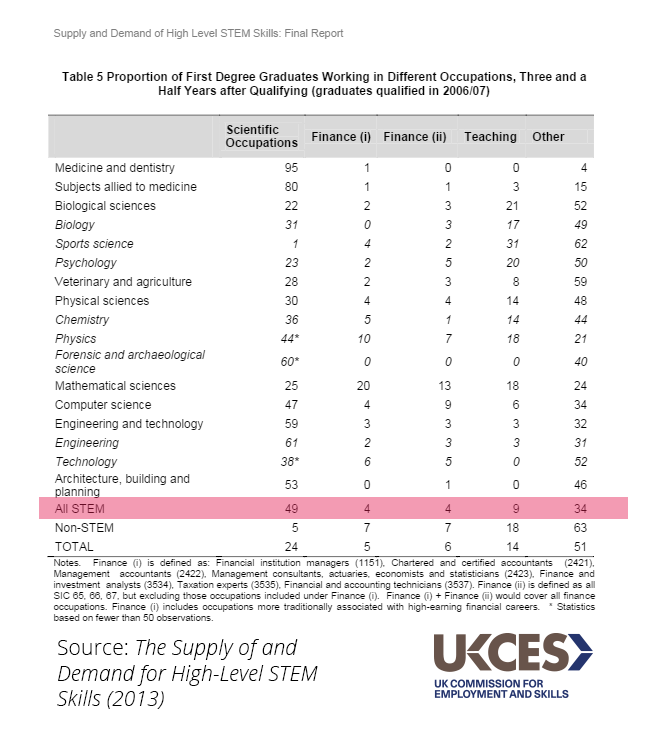 Our report on the supply and demand of high level Stem skills used statistics from the Higher Education Statistics Agency (Hesa) and the Labour Force Survey to quantify this effect. In this table, graduates’ degree subject is on the left-hand column, and the sectors in which they worked 3.5 years after graduating are in the other columns. All Stem graduates are summarised in the “All STEM” row; non-Stem graduates are presented for comparison in the “Non-STEM” row. Fewer than half of all Stem graduates were in a designated “scientific occupation” 3.5 years after graduating. Finance did account for a large proportion of the remainder: 8 per cent of Stem graduates were employed in the finance sector 3.5 years after graduating. However, the teaching profession accounted for more, with 9 per cent of Stem grads working as teachers. Surprised by this? Want to know more? Let us know in the comments below, or on Twitter - we're @UKCES. Find the full report into supply and demand of Stem skills on our pages on GOV.UK.